Please see our car parking charges. Motorcycle users: You can use any car park but there is dedicated space at Spinning School Lane car park. Parking for motorcycle users is free of charge. Coach and motor homes: One dedicated coach and motor home parking area (up to eight vehicles) at the Jolly Sailor Coach Park, Bonehill Road. Daily rate - £1.50 applies. 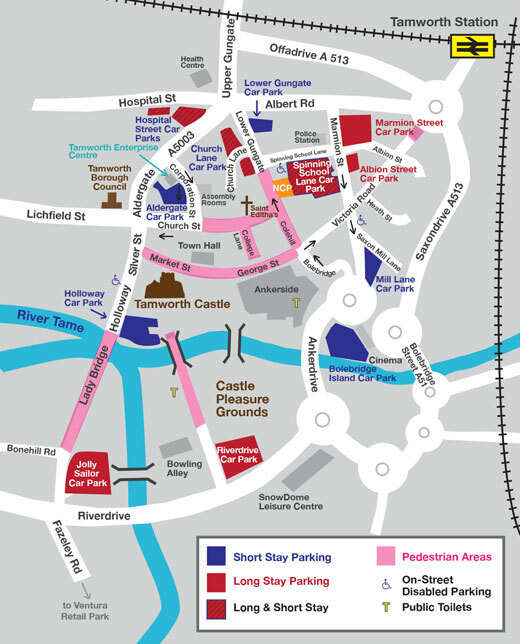 Motor homes are not permitted on any other Tamworth Borough Council car parks. Overnight camping is not permitted. The Council does not carry out routine gritting or snow clearance of car parks and the availability of resources during extreme weather conditions are limited and not reasonably practical. Gritting may also not provide any less of a risk in their use during icy conditions. The view of the Council is that during severe weather and the warnings in place to the public to travel, falling snow and ice provides a clear visible risk to the public and is no greater than the risk presented on a public footpath. The use of car parks is a matter of public decision and personal risk assessment. Car parks do not form part of the highways, which are a priority during this time. This will include road entrances to the car parks. Within resources available we do place some grit on some high footfall areas around machines and ramp accesses.